You’ve pondered installing your AC unit, added long weekends to your calendar, and filled all the space left in your fridge with canned wine and rum-soaked watermelon for sunny days spent in the park. Summer is here, and it’s the absolute best season to take in all that New York City has to offer -- from free concerts and outdoor movies, to day trips and day drinking, to these special summer events you can only catch once a year. Returning for its 39th year, the Museum Mile Festival keeps Fifth Avenue’s museums (like The Met, The Guggenheim, and The Cooper-Hewitt) open until 9pm with free admission, so you can indulge in complimentary culture and A/C for the evening. Outside, performers and food vendors help give the museum crawl a block party vibe. Spend an evening with grizzly bears, sea lions, reptiles, and more critters while drinking unlimited beer and wine from the open bar at the Bronx Zoo’s Brew at the Zoo. Seventy dollar tickets also get you access to karaoke, a live band, trivia, and a photo booth from 6-11pm. This annual aquatic parade down Surf Avenue returns for its 35th year with Blondie’s Debbie Harry and Chris Stein as grand marshals. Put on your best seashell bikini, stud your sunscreen with sequins, and you’ll fit right in. Karaoke, day-drinking, tacos, board games, and raw cookie dough (yes, from DŌ), are just a few of the things you can look forward to at this all-day party hosted by us. Tickets are $75. This annual cut-throat competition pits cheesemongers against each other in the most delicious way: With unlimited cheese and wine. Tickets are $70. Back for its second year, this outdoor communal picnic celebrating all things pink (especially wine), encourages you to break out all your Millennial pink accessories before sipping on rose... literally all day. Tickets start at $65. One of Pride Month’s most iconic events brings millions to the streets, with entertainers, activists, politicians, and celebrities marching down Fifth Avenue to promote LGBTQ rights celebrate progress. There are a few things you need to do to have an epic summer in NYC: Watch the sunset from a rooftop bar, spend Friday lounging in the park, and catch an outdoor movie. 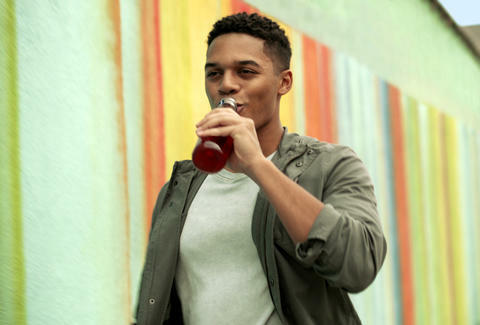 To keep you refreshed while you’re crossing things off your warm weather bucket list, you can now grab bottled Teavana® Craft Iced Teas on the go -- and keep cool wherever you are. 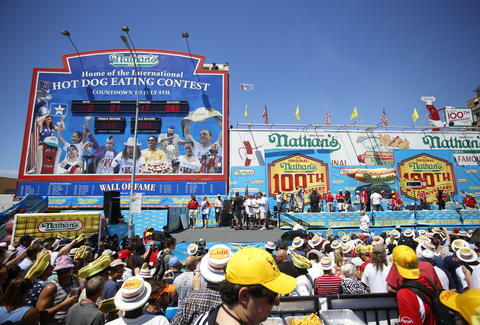 If you’re already feeling guilty about your own hot dog intake this summer, head to the annual Nathan’s Hot Dog Eating Contest to watch professional eaters eat way than you ever could, while trying to earn their way into the Hall of Fame. If you missed May’s prime #nofilter opportunity, head out to 14th, 23rd, 34th, 42nd, or 57th Street for the second and final Manhattanhenge sunset this summer and get yourself that perfect shot of the setting sun aligned with the skyline. Sycamore Bar & Flower Shop has teamed up with Nom Wah for a Dim Summer Garden Party, so you can enjoy Chinese dumplings and snacks while sipping cocktails in the outdoors. Tickets are $30 for a full plate of dim sum, a drink, and two raffle tickets. Whether you’re a Jollof enthusiast or have yet to try the popular Senegalese rice dish, you can taste countless creative variations of it at this Brooklyn fest celebrating all things Jollof. Tickets start at $12. This biannual three-week event returns with $29 three-course lunch menus and $45 dinner menus at hundreds of local and highly acclaimed restaurants. Let go of all your fears of strangers’ bare feet and dance the night away at this outdoor party and benefit for Bryant Park. Seventy-five dollars includes open wine and beer bar. This Gov Ball-esque music festival returns for its second year with headliners including Frank Ocean, Solange, MGMT, Belle & Sebastian, A Tribe Called Quest, and many more artists. Day passes start at $125. This festival brings out over 100 dragon boat teams, which will race in Meadow Lake while you entertain yourself on land with craft demonstrations, international performers, and a food court serving internationally inspired snacks and meals. The first-ever Queens International Beer Festival will feature brews from Europe, Asia, and, of course, New York, so you can taste your way around the world in the city’s most diverse borough. Tickets are $36. Whether you’re in a multi-team family or just can’t decide if you prefer (or care less about) The Yankees or The Mets, this series of games at Citi Field and Yankee Stadium -- pitting the city’s two baseball teams against each other -- is sure to be entertaining. Tickets start at $45. Stick a straw into eight different margaritas at this fourth annual bar crawl celebrating the citrusy, boozy blended drink. $65 tickets include drinks, but bring cash for tips. As part of the tour she announced during her Super Bowl halftime show, Lady Gaga will be stealing the spotlight at Citi Field for two nights this summer. Tickets start at $95. This annual international tennis competition may coincide with the speculated due date of Serena Williams’ baby, but plenty of other all-stars will still compete. If you don’t want to pay for tickets, consider volunteering at the stadium. Melissa is a writer living in NYC. Please invite her to hang out this summer if you have central A/C. Follow her on Twitter and Instagram.